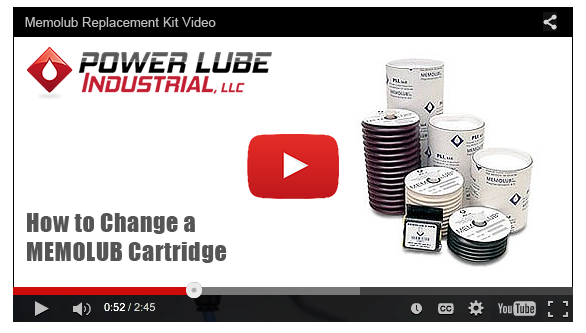 Each low cost MEMOLUB® Replacement kit normally consists of a disposable lubricant cartridge and MEMOLUB® Battery pack. When the lubricant cartridge is empty, simply dispose of the old cartridge and battery pack and insert new ones, its as easy as that. The replacement kit change-out normally takes less than 1 minute. The simple, replaceable lubricant cartridges are carefully pre-filled with the customers' choice of over 200 stock lubricants, thus eliminating the costly process of manually refilling reservoirs. Each size lubricator has its own corresponding lubricant cartridge and are not reusable. For continuous operating temperatures lower than those shown, available cold-weather battery packs should be used. Battery packs should be changed every time the lubricant cartridge is replaced to assure proper voltage to the system; and each battery pack should only be used once.